For years, companies have focused on keeping their customers happy. Like your customers, your job candidates are one of your biggest assets and can form an impression from the first time they engage with your company. However, applying a consumer-centric approach to your candidate’s journey is often forgotten. In order to attract and retain talent in today’s competitive market, you need to create a positive candidate experience that will be sure to make a memorable impression. Talent Acquisition professionals tuned into our “Win Candidates, Win Customers: The Consumer-Centric Approach to Candidate Experience” webinar hosted by Brian Smith, Senior Associate at Mercer to learn how to develop a meaningful candidate experience. 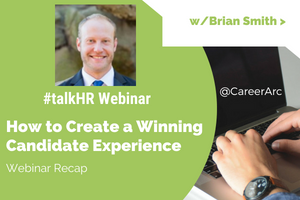 To help recap this latest CareerArc #talkHR webinar, we’ve highlighted three of Brian’s approaches towards candidate experience that will help impact your talent pipeline. Webinar Poll: Do You Notify Each Declined Candidate? The typical candidate spends three to four hours preparing and submitting a job application, although only one out of 219 applicants are ultimately hired. So, what happens to the rest of the 218 applicants? Brian kicked off the webinar with a poll asking attendees if they notify each candidate they decline that they have passed on their application. Only half of our webinar attendees said they get back to everyone they decline. 44% of attendees said they do not get back to everyone they end up declining for the position. A mere 7% of attendees said they have no idea if their company gets back to every declined candidate. In our recent CareerArc Candidate Experience study where we surveyed 1200 professionals, we found 72% of candidates who don’t hear back from employers say they would not be likely to recommend that employer’s product or services. They are also three and a half times less likely to re-apply for a job. It’s time to start thinking about your candidates differently. Treating your candidates like the customers your serve can reap the same benefits as a happy customer. An employer brand tells the story of what it’s like to work for your organization. Candidate experience is the view job candidates have throughout their application journey. With the labor market continuing to tighten, and a global skills shortage looming ahead, having a candidate experience and employer branding strategy has become a key component to attracting top talent. One of the best ways talent acquisition leaders can attract new talent is by differentiating themselves from their competition through employer branding. Along with your employer brand, your candidate experience impacts your success in the talent market. A good candidate experience and employer brand can lead to more applicants, a lower cost per hire, and positive reviews on Glassdoor. Today, 75% of job seekers consider an employer’s brand before even applying for a job. 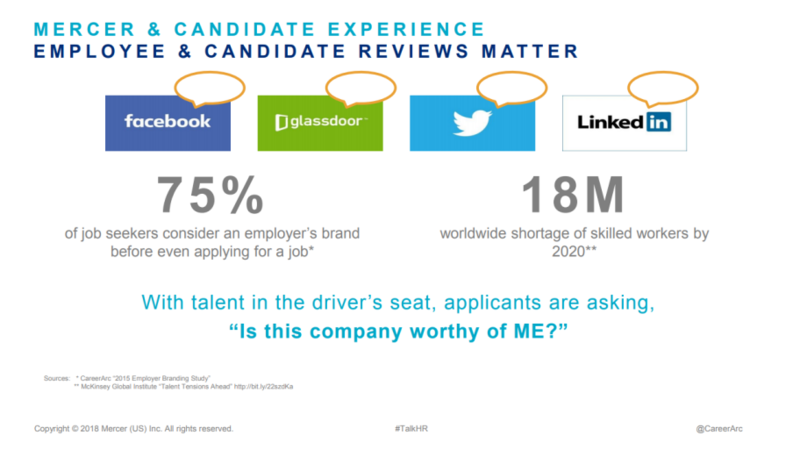 As Brian mentions, hiring has switched to a candidate driven market and job seekers are now asking, “Is this company worthy of ME?” So if the quality of your candidate experience and employer brand does not align it’s likely the candidate will not apply. By the year 2025 millennials will make up 75% of the workforce. With multiple generations under one roof, employers executing a one-size-fits-all recruiting approach find they are increasingly reaping diminishing returns. Recruiting millennial and generation z talent requires an understanding of what motivates these generations. Brian suggested changing the way we communicate in order to captivate the attention of these rising generations. 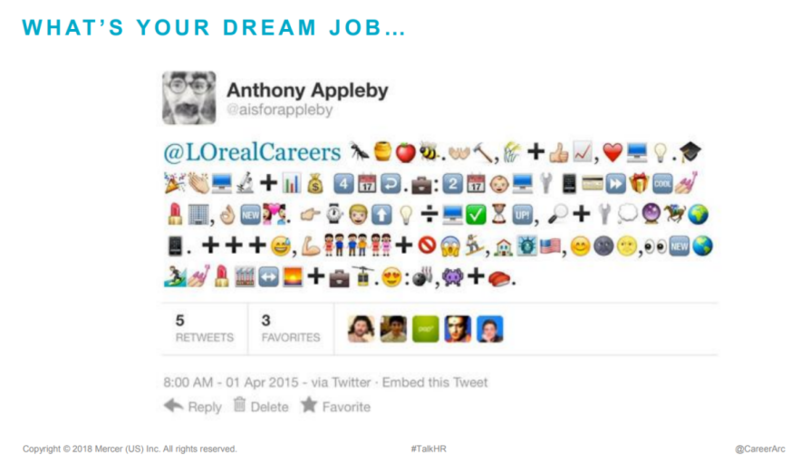 A great example of this came from L’Oreal who asked their current employees to describe their current job using only emojis. The campaign was such a success they asked job seekers interested in working for L’Oreal to describe their dream job using emojis. Anthony Appleby (@aisforappleby) responded to L’Oreal with the tweet above. In his tweet, Anthony described his education, professional experience, interests, and his dream job. Emojis can be a unique touch to add in your message to candidates. It can also put candidates at ease and show them you’re getting back to them in a creative way and help differentiate you from your competition. Creating a meaningful candidate experience can be achieved with a $0 budget. 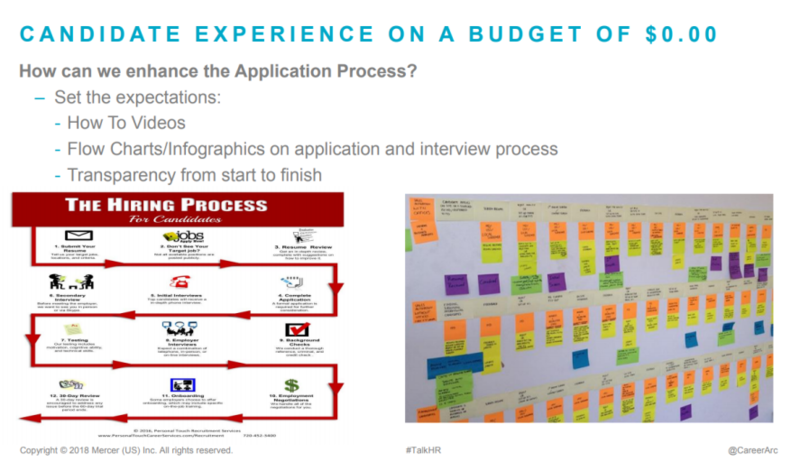 Brian wrapped up the webinar by sharing examples of how to enhance your application process and communicate with candidates throughout the process. Create how-to videos. Guide candidates through your application process by recording a video. You can create a video by using your own cell phone and posting it on your career site. Transparency from start to finish. Be honest with your candidates. Let them know each stage of your application process. The more transparent the better. Contact, contact, contact. Communicate with your candidates along the way and let them know where they stand in the application process. 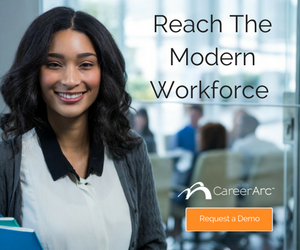 Providing a positive candidate experience for all even after the applicant journey has ended is what inspired the development of CareerArc Candidate Care, an online platform employers offer declined applicants to assist in their continued job search. How much do you know about the future state of recruiting? Put it to the test, download our Future of Recruiting Study now. Learn how to develop a meaningful candidate experience that will help you attract and retain talent in today’s competitive market.